The Abortion Caravan is a gutsy, fun, and bold example of direct action. The more recent attention to it seems to have resulted in a level of exposure and an attribution of importance that probably exceeds its actual historical significance to the pro-choice movement in Canada. When an event is popularized, perhaps even mythologized, there are new challenges to teaching its history. A reassessment of the Caravan underscores the importance of seeking balance when evaluating historical significance. If measuring accomplishment solely by the fulfillment of the demands of the Vancouver Women’s Caucus (VWC) to repeal the abortion law, it’s hard to call the Caravan successful since it took an additional 18 years before the Supreme Court overturned that law. But, there are several other ways to measure its significance in Canadian history. As the first national protest that called for unrestricted access to legal abortion, the Caravan brought important media attention to the issue. Through public speaking engagements, guerilla theatre performances, and feminist consciousness-raising sessions, Caravan participants connected with women across the country and learned from one another about their shared experiences with and fears of unplanned and unwanted pregnancies. As a woman-planned and woman-led event, the Caravan featured women stepping out from many male-dominated protest organizations of the New Left; they gained important experience and confidence from activism that emerged out of a period known as second wave feminism. Abortion rights activists did alter their message over the coming years, recognizing that advocating for the “right to choose” was more publicly palatable than “free abortion on demand.” The Caravan certainly served as a model for future direct actions, which activists over the next two decades knew were necessary to build “pro-choice” sentiment across the country. It is also important to remember that the outcomes of the Caravan were not all positive. Fissures that had grown among the women of the VWC during the cross-country trek were exacerbated when it came time to decide which women would be participating in the House of Commons protest. Soon after their return to B.C., the VWC splintered over the ideological differences that underlay strategic movement choices. 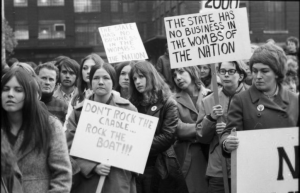 Exploring such political and ideological divisions among the various participants is an important part of complicating our understandings of Canadian second wave feminism and the Abortion Caravan and its legacy. Finally, as Karissa Patton’s piece explored, the importance attributed to the Abortion Caravan has made it a target of anti-abortion activism. The efforts to alter the meaning and legacy of the Abortion Caravan are just a small part of an ongoing campaign to reverse the gains made by the pro-choice movement and reproductive justice advocates. Contemporary studies of access to abortion services remind us that the historical struggle for abortion rights is also an ongoing one. Christabelle Sethna is an associate professor in the Institute for Feminist and Gender Studies at the University of Ottawa. Shannon Stettner is a Post-Doctoral Visitor in the Department of Political Science at York University. Christabelle Sethna and Steve Hewitt, “Clandestine Operations: The VWC, the Abortion Caravan and the RCMP,” Canadian Historical Review 90, 3 (2009): 463-496. As quoted in Shannon Stettner, “Women and Abortion in English Canada: Public Debates and Political Participation, 1959-1970” (PhD dissertation, York University, 2011), 288.